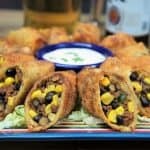 Filled with seasoned ground beef, black beans and corn, these southwestern egg rolls are super flavorful and really easy to make. The beef filling comes together quickly and we take some help from the market by purchasing the egg roll wrappers. Making the egg rolls is pretty easy, after rolling two or three, you’ll be a pro! Add the chili powder, salt, garlic powder, cumin and black pepper to a small bowl, stir to combine. Heat 1 tablespoon of oil in a large skillet over medium-high heat. Add the ground beef and sprinkle the top with the prepared seasoning mix. Stir, to mix well. 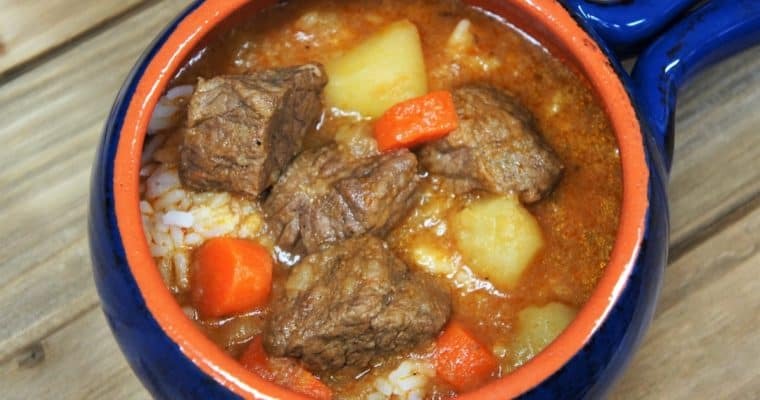 Cook the ground beef until browned, approximately 5 minutes, stirring frequently and breaking up the meat with a wooden spoon or spatula. Add the tomato sauce to the skillet, stir well to combine. Lower the heat to medium-low, cover and cook about 20-25 minutes, until cooked through, and most of the liquid has cooked out, stirring occasionally. 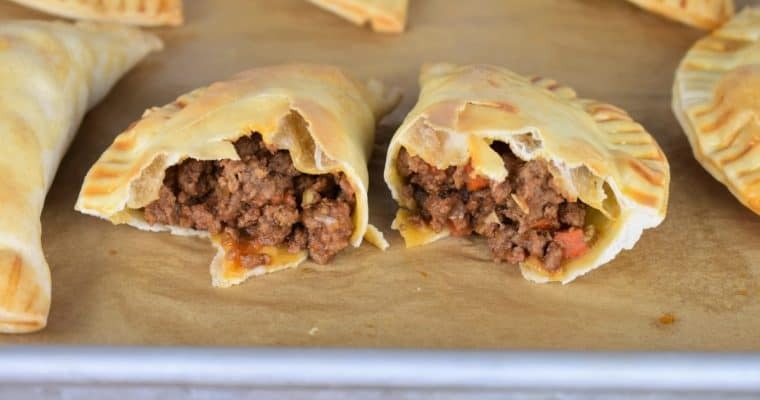 Because we’re going to be using the ground beef to make egg rolls, then frying them, we want don’t want the filling to be greasy or saucy. If there is excess oil in the skillet, drain it. To do this quickly and neatly: off the heat, pile the ground beef to one side of the skillet and tip it slightly so the oil pools on the other side. Scoop out the oil using a large serving spoon or ladle and add it to an empty can or container. Continue scooping until most or all of the oil is gone. Then level the skillet and stir, voila, all the oil is gone! Set the ground beef aside and allow it to cool a bit. Add the black beans, corn and green onions to the skillet, stir to combine well. Add the egg to a small bowl and beat well. Lay the egg roll diagonally in front of you (like a diamond). Add 2 heaping tablespoons of the ground beef filling in the middle. Fold the side closet to you in, and then bring in the sides. Using a pastry brush, moisten the exposed edges of the egg roll wrapper with the beaten egg then roll tightly. Press the edges lightly to ensure the seal. Set the egg roll aside on a pan or plate and cover with a moistened paper towel to prevent the skin from drying out. For best result, line the pan or plate with parchment paper to reduce sticking. Repeat until the wrappers or filling are used up. Add enough oil to a large, deep skillet to cover the bottom by about a ½ inch of oil. Heat the oil over medium-high heat, when the oil is hot but not smoking, add about 6 egg rolls to the skillet (depending on the size) do not crowd the pan. Turn the egg rolls frequently to brown on all sides. Cook for about 3-5 minutes until the egg rolls are a beautiful golden color. Remove the egg rolls from the skillet and place them on a paper-towel lined plate or pan. Repeat with the remaining egg rolls. 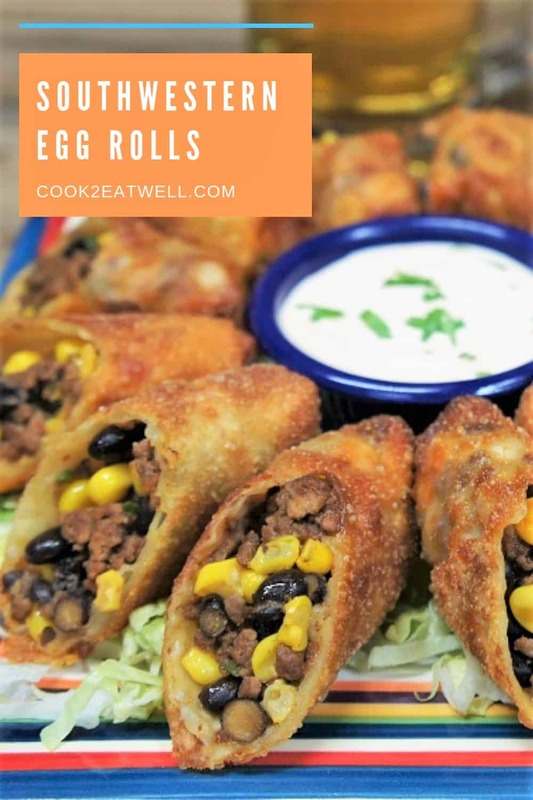 When the egg rolls have cooled a bit, slice them in half and arrange them on a plate or platter. 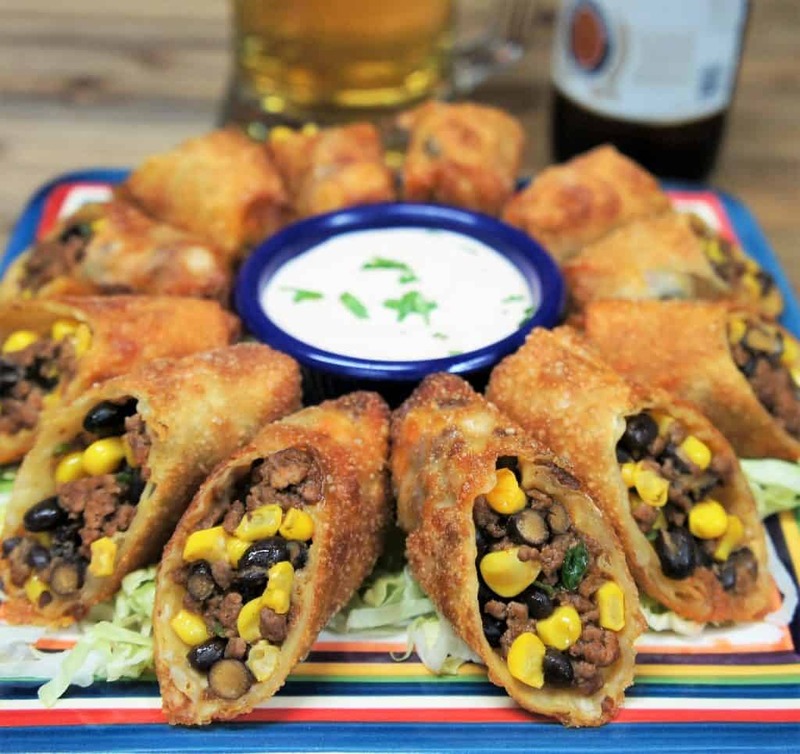 Serve the egg rolls with hot sauce and sour cream, if desired. Between batches, remove the skillet from the heat until you’re ready to put in the next batch, don’t turn off the heat, just move the skillet to a cold burner. Also lower and raise the heat as needed, not much, just a notch or two. Add the chili powder, salt, garlic powder, cumin and black pepper to a small bowl, stir to combine.. When the egg rolls cool a bit, cut them in half and arrange them on a plate. Serve the egg rolls with hot sauce and sour cream, if desired. 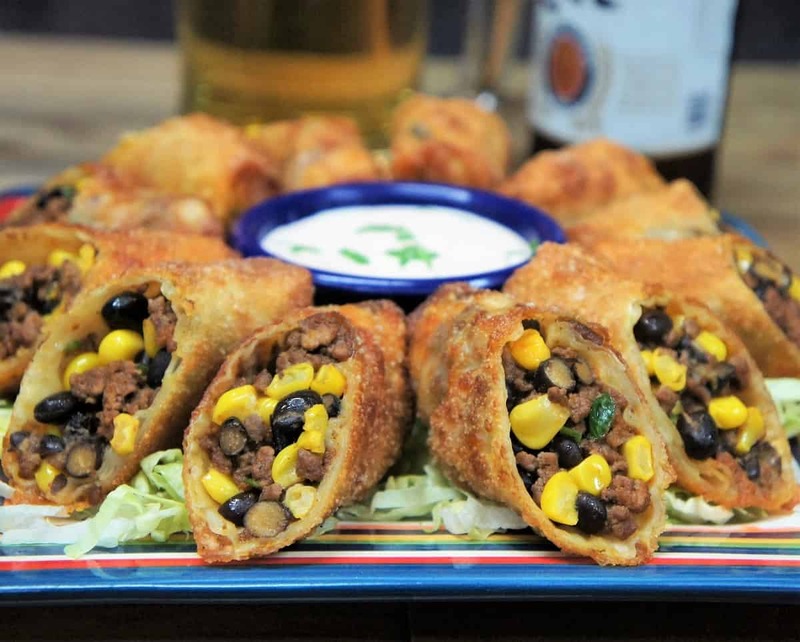 Because we’re going to be using the ground beef to make egg rolls, then frying them, we want don’t want the filling to be greasy or saucy. If there is excess oil in the skillet, drain it. To do this quickly and neatly: off the heat, pile the ground beef to one side of the skillet and tip it slightly so the oil pools on the other side. Scoop out the oil using a large serving spoon or ladle and add it to an empty can or container. Continue scooping until most or all of the oil is gone. Then level the skillet and stir, voila, all the oil is gone!